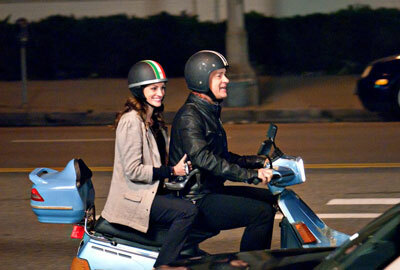 The film Larry Crowne is billed as a romance, but I had a hard time getting romantic about it. First of all, and forgive me for saying this, but Tom Hanks is just not romantic-leading-man-material any more. Not only that, but it took me a long time to figure out what the deal was with his character (which is, of course, Larry Crowne). Larry is so enthusiastic about his job at a big box store (ala Walmart), and so seemingly clueless about how life in general works, that at first I thought maybe he was a little slow, that Hanks was reprising his Forrest Gump role. Larry gets fired from his job because he doesn't have a college education (I'm sorry, you need a bachelor's degree to work at Walmart?) so he enrols in some courses at a community college. There, the other, much younger students are so friendly I suspected them of double-dealing. But no, they're just a bunch of community college kids anxious to let some 50-plus guy into their little group. Is this how community college always is? Maybe the writers of the screenplay, Hanks and Nia Vardalos (star and writer of My Big Fat Greek Wedding), took their cues from the American TV show Community. Nevertheless, it struck me as rather unrealistic. A sad, aging divorcee, Roberts plays the part with a tour de force which was the only thing that kept me watching.The one, true, shining example of reality in this film is Julia Roberts' character, Mercedes Tainot, Larry's speech class instructor. She's cranky and she drinks too much. A sad, aging divorcee, Roberts plays the part with a tour de force which was the only thing that kept me watching. You don't need a spoiler alert to keep you from guessing that Larry and Mercedes get together in the end. Still, it seems unlikely that this brilliant, beautiful woman would go for Larry, no matter how lovely a human being he may be on the inside, or how damaged she is. Yet that point brings me back to the writers, Vardalos and Hanks. The only other film that Hanks wrote that really stands out is the 1996 charmer, That Thing You Do. Vardalos has written a few things since My Big Fat..., all of them atrocious, except for the 2004 Connie and Carla. Okay, so they have a couple of decent movies under their belts; that doesn't make them a crack writing team, which is entirely evident in the case of Larry Crowne. Besides, I feel like Vardalos' idea of strong characters is to have everyone be super nice and smile all the time. Oh, and did I mention Hanks directed it? In my opinion, he needs to utilize his considerable talents elsewhere, and Roberts needs to steer clear of a bad script even if her good pal Tom Hanks asks her to do it. She's too good to waste her talents on the likes of Larry Crowne. Not the worst movie I've ever seen, just highly forgettable. After writing this review, I doubt I'll ever think about it again.